The Economic Security Index (ESI) measures the share of Americans who experience at least a 25% drop in their available family income whether due to a decline in income or a spike in medical spending or a combination of the two, and who lack an adequate financial safety net to catch them when they fall. A higher ESI therefore indicates greater insecurity, much as a rising unemployment rate signals a faltering economy. Currently the official ESI is calculated from 1986-2011 based on data from the Current Population Survey, the Census Bureau’s official source of poverty and unemployment measurement. Because the ESI is a conceptual framework, however, it can be measured across multiple sources. Previously, the ESI was calculated using the Survey of Income and Program Participation, another Census Bureau data source, beginning in 1985. Additionally, a more limited version of the index is available using the Panel Study of Income Dynamics, which extends back to the late 1960s. 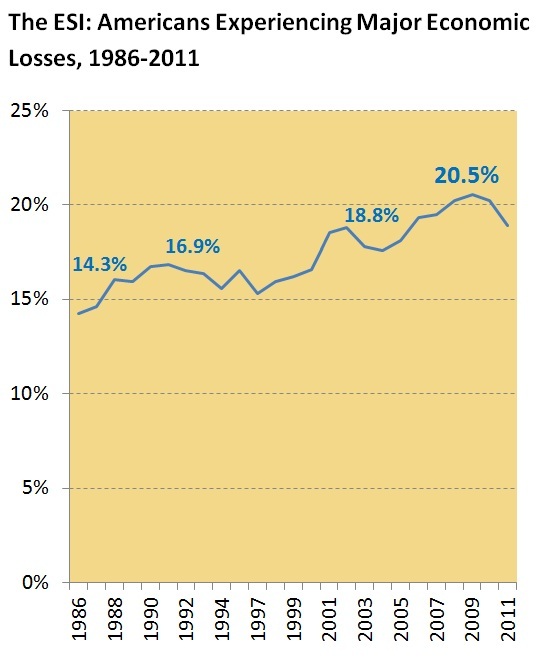 The ESI looks at actual economic losses, not at who fears or is vulnerable to them. The threat of such losses is real and growing for all Americans. Financial insecurity has increased. In 1986, 14.3 percent of Americans experienced a major economic loss sufficient to classify them as insecure in the ESI. During the recession of the early 2000s, this had risen to 18.8 percent. In 2009, the level of economic insecurity experienced by Americans was greater than at any time over the past quarter century, with approximately one in five Americans (20.5 percent) experiencing a decline in available household income of 25 percent or greater. The extent of economic security varies substantially across the population but has risen for virtually all groups. Those with the most income and education have faced the least insecurity. The less affluent, those with limited education, African Americans, and Hispanics have faced the most. 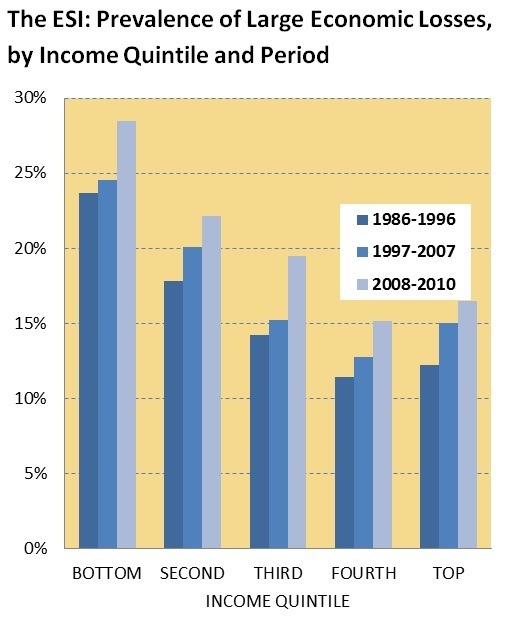 The differences are large: On average over one in four (24.6 percent) of the poorest Americans—those with household incomes in the lowest quintile— suffered a major economic loss from one year to the next between 1997 and 2007, compared to 15 percent of those in households in the top income quintile. Virtually all groups, however, experienced significant increases in insecurity over the past 25 years.